Sprint may or may not merge with T-Mobile soon, but until that happens (or not), the nation’s fourth-largest wireless service provider is obviously doing its own Black Friday thing, heavily discounting some of the newest, most powerful, and most popular smartphones for a limited time. Believe it or not, you can get Samsung’s Galaxy S9, Galaxy S9+, and Galaxy Note 9 for as little as $5, 10, and $20 a month respectively through December 2... as long as you’re okay with bill credits and understand the terms and conditions of the Sprint Flex lease program. Basically, these phones won’t be yours at the end of the 18-month Flex term, but you will be able to own them in exchange for an additional fee, choose to upgrade to a newer and better handset, or continue your lease. Either way, what you have to keep in mind here is that the Galaxy S9, S9 Plus, and Note 9 are normally a lot pricier than the aforementioned monthly rates with Sprint Flex. Namely, you’re looking at savings of between $21.67 and $28 every 30 days via bill credits. Meanwhile, if you pick one of Apple’s latest iPhones instead, you’re eligible for a free XR. 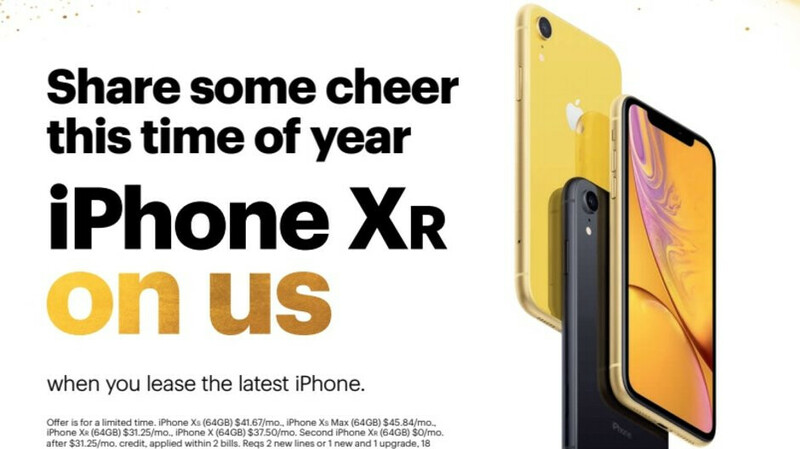 You can mix and match an iPhone XS or XS Max (on a lease agreement) with your complimentary iPhone XR (after bill credits) or just get a pair of festive XRs for yourself and a special someone this holiday season. Next up, the LG V40 ThinQ is not only discounted from $40 to $20 a month with a Sprint Flex lease arrangement, also including a 49-inch 4K Ultra HD Smart LED TV at no extra cost. We’re talking a $500-worth freebie here, although you may need to wait a while (up to 8 weeks) until the smart TV arrives on your doorsteps. Apple’s aging but extremely popular iPhone 7 is probably Sprint’s top bargain this Black Friday, fetching a measly $4.17 a month on a straightforward device payment plan, which means you’re looking at a grand total of $99.99 to own this robust iOS handset. The sixth-generation iPad is also $99.99... with a separate iPhone lease, and last but surely not least, both new and upgrading Sprint customers are eligible for a cool $100 Apple Watch Series 4 discount. There’s truly something for everyone here.